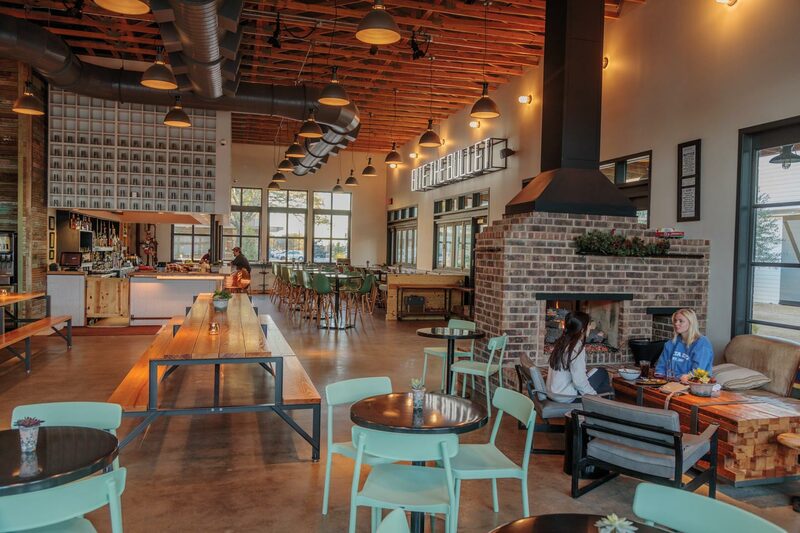 Sitting down to a late-afternoon drink at The Stella Hotel’s airy lobby bar in Bryan, awash in natural light spilling through floor-to-ceiling windows, my overriding thought is, Ahh. At last. 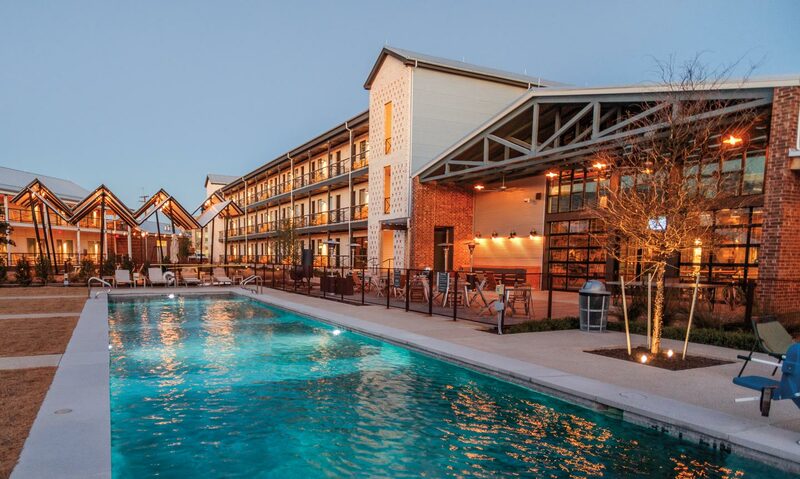 The twin towns of Bryan-College Station, with Texas A&M University and a booming biotech research industry, can finally host visitors in the kind of sophisticated boutique hotels found in big cities. 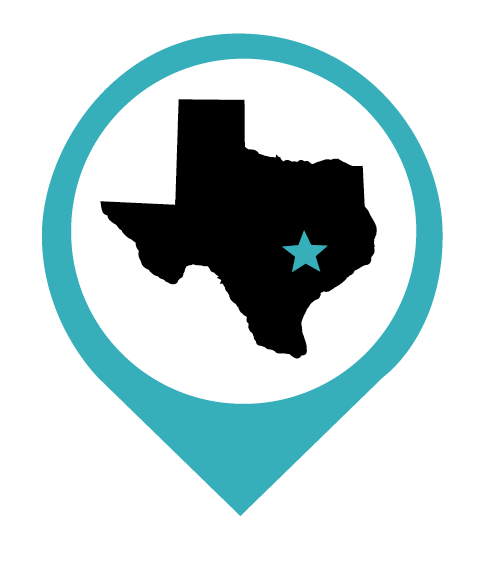 Fortunately, the hotels have made no sacrifices in small-town friendliness, immersing guests in elegance while also making the experience warm and personable—-just the way we expect to find things in the heart of Texas. As Texas A&M has blossomed into one of the nation’s largest universities, visitors longing for special lodgings get their reward in triplicate—in Bryan, The Stella Hotel, and some 4 miles to the east in College Station, Cavalry Court and The George. Each bears its own distinct and appealing personality, making them markedly different from one another. I’d happily return for a stay at any of them again. At The Stella, I’m enjoying a Sammy cocktail while indulging in lobby people-watching and taking in the nearby patio scene, where guests visit next to a fire pit or work on laptops. Refreshing and tart, the Sammy features grapefruit-infused vodka, freshly squeezed grapefruit juice, and a dash of bitters. 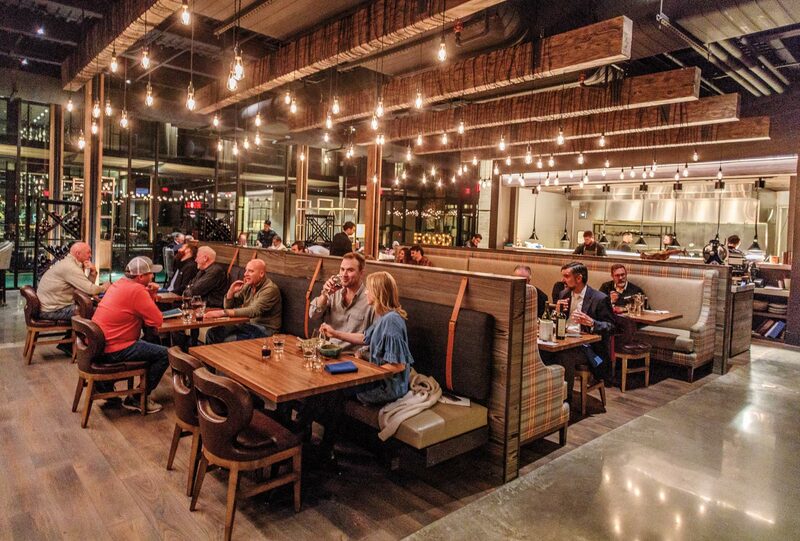 The staff conjures up beverage recipes throughout the year, just as the culinary team at Campfire, the casual restaurant just beyond the bar, produces a menu of dishes crafted from seasonal vegetables, cheeses, meats, and fish. My leisurely dinner at Campfire includes grazing on blistered shishito peppers sprinkled with Cotija cheese and brightened with squeezes of lime. I’m especially taken with my plate of Gulf snapper, pan-roasted until crisp at its edges but silken and juicy inside, with accompaniments of grilled okra, tomato, and Japanese eggplant. I give high marks also to the beef filet, served in satiny slices with roasted purple potatoes and tiny, sweet onions. After-dinner sipping takes place in Hershel’s, a pretty saloon decorated with sumptuous couches, overstuffed chairs, and a hodgepodge of vintage A&M student photos, antique books, and found antlers. It reminds me of a comfy den at a family lodge. Because the 176-room Stella anchors a new development called Lake Walk, guests have convenient options for working off these indulgences: You can climb the 75-foot-tall observation tower overlooking 5-acre Lake Atlas, just outside the hotel’s front door, or hit the walking trail that circles the lake. Just beyond the lake is Traditions Club, with a Jack Nicklaus-designed golf course. A midweek farmers market called The Local brings activity to Lake Walk, as do a growing number of boutiques. Weekend concerts, complete with food trucks, attract both area residents and out-of-towners. After a night in my comfortable room with a sensational view of the countryside, I enjoy a custom pour-over coffee downstairs in P.O.V., the coffee-and-pastry shop off The Stella patio. Then it’s time to explore the new hotels over in College Station. My first stop is Cavalry Court, where a beautifully restored Army Jeep marks the entrance to a modern 141-room lodging. Paying homage to the university’s revered Corps of Cadets, the Cavalry Court’s inspiration borrows from elements of the 1950s American military, both in guestrooms and common areas. A red-brick courtyard, brightened with a lilypad-strewn pond, leads to both the lobby and the Canteen Bar and Grill, a restaurant and bar whose appetizer selection includes an indulgence called “Canteen Fries,” which are french fries topped with apple-smoked bacon and chives, served with duck fat hollandaise. Dinner options for later include pork belly sliders and petite filets with fingerling potatoes and smoked chile butter. Live music is always on tap on weekends, too. Throughout the Cavalry Court property, retro design elements bring a smile. In the Canteen restrooms, for instance, the vintage black and white tile floors bear a message before the wash basin: At Ease. The guest rooms feature closets fashioned like barracks lockers, couches covered in Army green fabric, and snack boxes resembling military MRE shipping crates. Artwork includes pen-and-ink A&M Corps llustrations. Facing the Cavalry Court’s entrance, The George is the second new hotel in College Station proper. The two share a driveway and valet parking, and guests from both hotels can borrow bicycles parked to the left of The George’s front door. Named “for notable Georges in history,” including 41st U.S. President George H.W. Bush, whose library and museum are just a short distance away, The George manages that artful balance of providing luxurious elements without seeming fussy. I like the lobby’s contemporary art touches, including a wall of thousands of red, white, and blue book spines fashioned into the image of the Texas flag. 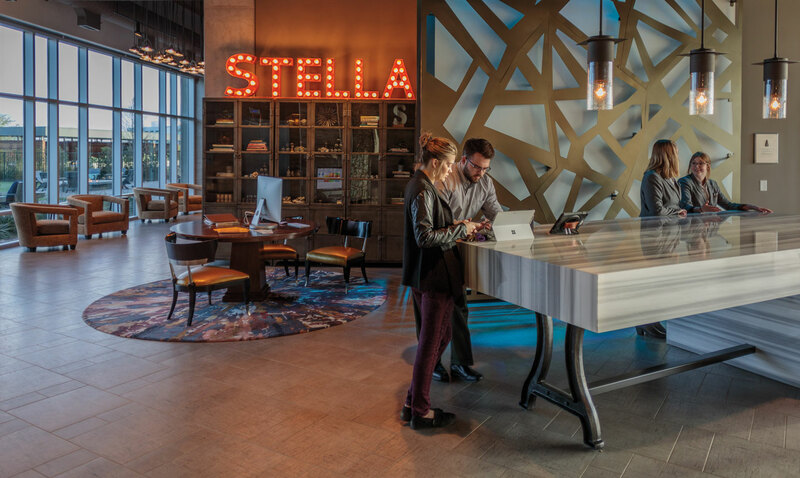 Whimsical as can be, a flock of white sheep statuary emblazoned by neon graffiti stands in groupings throughout the lobby and adjacent common areas. A broad light fixture in the coffee and cocktail bar area features a base made of pretty liquor bottles. A wall of worn leather boots brings into focus notions of the Corps and Cavalry—and even the Wild West. Design details around the elevators and on guest floors evoke train schedules and platform notations, as College Station was once an important rail stop. Outside the lobby, red rocking chairs surround a long swimming pool with simple, sleek lines. Beyond the pool, a dinner-only restaurant called Poppy—a reference to the elder President Bush’s family nickname—describes its concept “farm to fire.” Each dish bears intricate composition; think of every plate as a small artwork in its own right, with an arrangement of meat, fowl, fish, or vegetable decorated with tiny and precise bits of spices and herbs. Exotic offerings include blackbuck tartare, boar, skate wing, and pork cheek, items that set the restaurant apart from the usual fare in these parts. Which, of course, is just the point. It’s a new day in Bryan-College Station for the wanderer in search of a luxurious hotel experience, and one bringing an urban interlude to a place that still feels happily downhome.